The following pages are a set of basic guidelines and points to think about when considering a hedgehog as a pet or to broaden your knowledge about this curious critter. This guide is based on our knowledge and experiences over a number of years researching, owning, breeding, and selling hedgehogs as pets. The information presented here is based on hedgehogs in general. There are always exceptions to guidelines in the animal world, but we have tried to provide you with lots of tips and suggestions that will get you off to a great start with your new pet. Please be advised that many books, web sites, and even veterinary articles and manuals may contain outdated or inaccurate information. Millermeade Farm’s “Critter Connection” strongly encourages you to refer to our Resource and Reference guide for more details on the topics addressed here. Please feel free to contact us if you have any questions about our animals. Our best comparison of hedgehog intelligence is to that of a hamster. Hedgehogs do not typically come when called or actively seek out human interaction. Hedgehogs may learn certain behaviors through positive reinforcement or conditioning but only at a very basic level. We strongly believe that hedgehog personality is shaped and molded through owner interaction. Proper handling and consideration of the hedgehog’s needs is critical to successful socialization and bonding as well as enjoyable pet ownership for both you and your pet. It is common for people to notice a personality “change” in their hedgehog once it reaches its new home. This is generally due to the stressors of changing its environment and having a new person take care of it. You will need to be patient, and keep working with your new pet. Pet hedgies do best if handled every day, and they make take a long time to become accustomed to their new owners and environment. Hedgehogs do best in 70˚- 80˚ F temperature ranges. We have found the optimal temperature for our herd is 75˚. You must be prepared to provide additional heat sources if your house is maintained at cooler temperatures in the winter. The amount of maintenance required is determined in part to the cleanliness of the hedgehog and your perception of “work” as an owner. Hedgehogs themselves require very little from their caregivers. Fresh food and water and regular cage cleaning are the basic requirements. They don’t need to be walked and most seldom need bathed. Hedgehogs are quiet by nature, and the most noise they make is their wheeling activity and possible cage rearranging or water bottle banging. 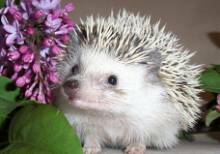 A regularly maintained cage and hedgehog that is fed a good diet typically does not smell. Most hedgehogs are neat about their elimination habits and some will regularly use a litter pan. There are a few, rare hedgehogs that will try to defy every sense of cleanliness and make a complete mess of their cage. Unfortunately, there is no way to look at a hedgehog and determine which ones will use a litter pan and which ones will smear feces about their enclosure. One must be careful not to take the hedgehog’s easy care for granted. A hedgehog that is not closely monitored can become neglected if a problem is not addressed in a timely manner. Most hedgehogs clean themselves through a process of licking, scratching, and shaking. Some hedgehogs do require bathing if they accumulate feces on their feet or quills. In the wild African Pygmy hedgehogs are insectivores, but they are quite opportunistic and are known to feed on carrion (other dead animals), birds’ eggs, and any lizards, snakes or other small animals that should happen to catch. In the past, cat foods were the only food available for captive hedgehogs. Advances have been made in the knowledge and understanding of hedgehog nutrition. Many commercial hedgehog foods are available, but they are not all equal in nutritional value or ingredient quality. Unfortunately, some foods marketed as hedgehogs are quite inappropriate as a staple diet. Cat food is often used in place of hedgehog food, but again: Care must be taken to make sure it is nutritionally sound. More information is available in our Nutrition Overview, Food Comparison Charts, Diet Recommendations guide, Hedgehog Treats article, and Insects a La Carte guide. Patient – hedgehogs are shy by nature and will depend on your patience as they learn to trust you. Thick skinned – hedgehogs are prickly and they can poke you! This is something you can learn but hedgies are certainly not for you if you are afraid of getting spiked or bit. Gentle – you must be gentle with hedgehogs if they are going to trust you. Observant – your hedgehog is going to depend on you 100% for their needs. You will need to recognize its needs and its subtle ways of communicating. Financially responsible – hedgehogs aren’t cheap and they are most likely to require veterinary care at some point in their life as well as food and supplies throughout their life. Accepting – You must be willing to accept what your hedgehog has to offer. It will most likely never follow commands or do tricks but its quirky habits and the affection it may share can make it quite charming. I know for a fact that almost every parent who has contacted me about a hedgehogs as pet for their child has an exceptionally bright and talented child that is extremely good with animals. My children are J. While this may be true, a hedgehog still may not be the right pet for every family. We have found that hedgehogs do best in families where the hedgehog is a family pet and adults are closely involved in daily hedgehog care. It is extremely important to monitor the hedgehogs eating, activity levels, temperature, and health every day. Many youth’s interest in hedgehogs can fade over time as their attention is focused on extracurricular activities and other interests. It is best to have another family member who is willing and able to care for the hedgehog, should the primary owner no longer be able to give their pet the proper attention it needs. Veterinary care for any pet can be quite costly, and it may be unrealistic to expect youth to be solely responsible for 100% of future financial needs. Hedgehogs can make wonderful classroom pets ONLY under certain conditions. First and foremost, the primary care giver meets and understands all the requirements and guidelines for having a hedgehog as a pet. Not all hedgehogs are good candidates for classroom living and the primary care giver should be willing and excited to have a hedgehog as a pet even if it doesn’t work out in the classroom. The primary caregiver should be comfortable and skilled at handling before teaching others to properly care for and handle this unique creature. We do NOT recommend that hedgehogs stay in the classroom alone over the weekends. We do NOT recommend that hedgehogs go home with various students over the weekend or summer. This drastically increases the risks of problems and resulting deaths. Under the right conditions hedgehogs can be great tools to stimulate learning and can be an exceptional therapy animal as well. The compatibility between pets will depend on each pet’s personality. It is important for your cages to be safe and secure from other pets until you know how they will interact. All pet interactions should be closely monitored until you are sure your pets are safe in each other’s presence. Cats and dogs that are “hunters” or very playful may not do well with your hedgehog. Your hedgehog should not be a toy for your other pets. Sometimes overly curious pets can intimidate or scare your hedgehog. You don’t want the hedgehog to be afraid or nervous so you need to carefully supervise all pet interaction. The average dog and cat will quickly gain respect for your little ball of prickles especially when its curious nose gets poked! A huffing and puffing ball of prickles may intimidate some cats and dogs and be just enough to keep the other pets at a safe distance. Ferrets are also miniature little hunters who may be more dangerous to your hedgehog than the average dog or cat. Some hedgehogs may develop bonds with other pets and even sleep and play together. All pet interactions should be carefully monitored. I have seen some nasty pet rat bites and quill chewing on a hedgehog that played “well” with the rat. A word of caution: bacteria can be transmitted between pets. What is normal flora for one pet may cause problems with other pets. We have noticed a trend in families who own birds and/or reptiles and hedgehogs. These families seem to have an increase in bacterial infections including Giardia, Coccidia, and Clostridium in their hedgehogs. No studies have been done on this topic but since this is a trend we have noticed, we think it warrants our expressed concern. Please consult your veterinarian about these risks. Zoonotic diseases are diseases that can be transmitted from animals to humans. Any animal has potential to transmit illness to humans, just like humans can spread contagious diseases to other humans. Hedgehogs are not known to carry any diseases dangerous to humans. However, hedgehogs do have different normal flora than humans carry so young children, the elderly, and others with compromised immune systems are at greater risk for potential problems. Proper hand washing and cleaning is key to preventing illness. Young children are prone to putting their hands in their mouth, which is also likely to increase the risk of potential problems. Hedgehogs are cute and cuddly and it is tempting to kiss our sweet pet. Each state, city, township, or municipality may have their own restrictions on hedgehogs or other exotic animal ownership. Hedgehogs are prohibited in Georgia, California, Pennsylvania, Alabama, Maine, Vermont, and Hawaii. We suggest that you further investigate the legality of hedgehog ownership if you live in one of these states. Hedgehog ownership is restricted in Arizona, Maine, New Jersey, and Oregon. We suggest that you further investigate the legality of hedgehog ownership if you live in one of these states. According to federal regulations, all retail pet stores are required to have a USDA license to legally sell hedgehogs. The federal regulations also stipulate that breeders with 3 or more females are required to have a USDA license. We encourage you to purchase your hedgehog from licensed dealers. We strongly believe that buying from a reputable source and getting the right handling instructions are critical to your happiness and success with your new pet.